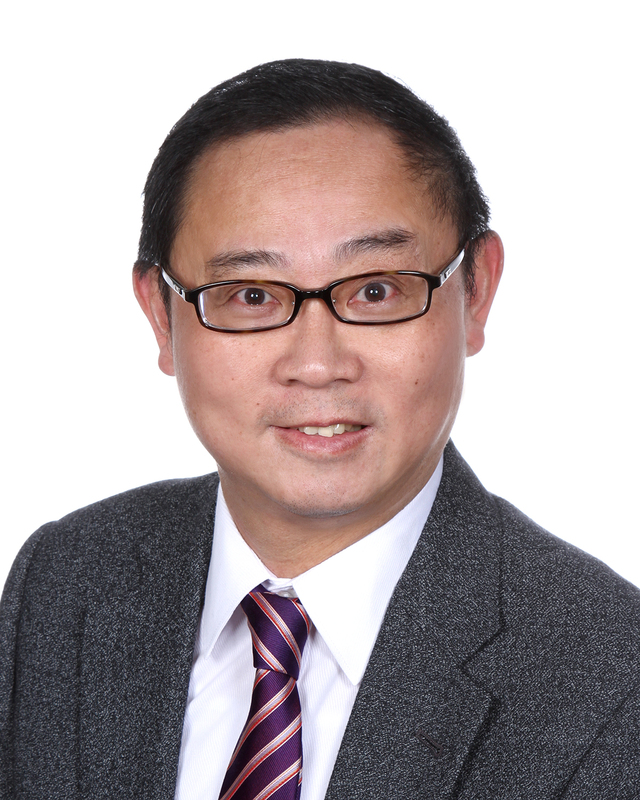 "We have had the pleasure of working with Philip Chan over the course of selling our Kitsilano home and buying another property. While we consider this one of life’s major (sometimes stressful) transactions, Philip continually provided calm professional guidance, expertise and advice. He is an action-person with a focused style that kept us motivated and happy throughout. He accomplished many feats, leveraging and negotiating when necessary, but with the highest integrity and compassion for his clients and all those involved. We are glad to have met Philip – and call him our friend." "I have worked with several realtors in my time but none have come close to Philip in terms of professionalism, integrity and action. Philip sold my last two homes and both times he did it in about one week, getting well above the asking price both times! I could not be happier with him and his team, and would not consider any other realtor. He even saved me money on the legal fees with his expert knowledge on all aspects of buying and selling. He is very experienced in the metro Vancouver market and appeals to all types of buyers and sellers." "Over the course of a week I called several agents and they all said that they would get back to me, none of them did. I called Philip and his team and I had all the information that I needed in my hands the very next day - now THAT'S what I call SERVICE!" "Our family would like to tell you how much we love having you as our agent. You have really worked with your heart and soul to help us sell our home. We could never have done it without you." "First let me say that I thank you and your terrific staff for all that you did in marketing my house…All my best to you and your family. You are a wonderful person and I feel fortunate to have had the pleasure of meeting you." "Just wanted to say thank you for everything you did for the sale of our home! You sure go the extra mile! Don't know how we could have gotten thru all this without you. I really appreciate your time, effort and help…You pulled it off without a hitch & we think you're pretty great!" "Not only does he possess the highest integrity, telling you exactly like it is, but he is an incredible negotiator, doing everything within his power to protect your interests throughout the entire transaction. Philip has now sold three homes for us - really fast - always getting us the price that he said he would get…He is readily available to meet with us at our convenience, be it after business hours, which we find incredible considering the amount of business he does…If any of our friends or relatives need real estate assistance, we always insist that they call Philip because we know first hand that he is consistent, and will give them the same dynamite service that he has given us each and every time that we have sold a home with him…"
"Congratulations on your induction to the RE/MAX Hall of Fame! This is a tremendous career achievement for you and one of which you should be most proud. We realize the overwhelming effort that you have expended in order to reach this goal and it is our pleasure to be among the first to congratulate you. Providing consistent customer service is an integral part in earning this prestigious award and it is obvious that the quality of your service is unsurpassed. 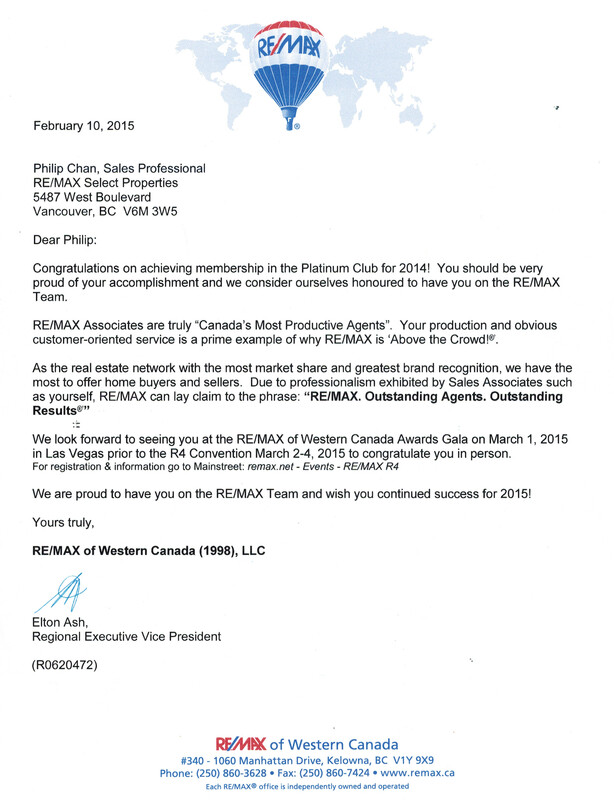 It is truly a pleasure and an honor to be affiliated with you within the RE/MAX organization." "I am writing this letter to thank you and your colleagues for excellent service related to selling my property. From my initial meeting with you I was impressed with your professionalism and interest in providing service. I briefly explained that the property had been a ‘family home’ for over 50 years and that it was being sold following the recent passing of a family member. It was important to our family that the property be dealt with in a sensitive manner. You noted your familiarity with the area and that a written market plan would be provided in a few days. As a result of the market plan and related comments, I decided that you would provide the dedication and sensitivity in dealing with the sale of the property. During the showing period there was considerable interest requiring a great deal of your time. From your observations you suggested small but important changes to the marketing plan. The consequence was that the selling price substantially exceeded expectations. In addition, your understanding of family concerns regarding the property was much appreciated. Thank you for a super job!" "We really like working with you Philip. You are efficient, fast, and with great focus...you get the job done! We really appreciate this. We want to work with you again and will soon. You are an excellent agent. We wish we had met you many years ago instead of going through several bad experiences with other agents. Thank you." Linda and I want to thank you for the efficient and effective service you provided us in listing and selling our duplex building and home. You set it at the right price, secured offers within two weeks of it arriving on the market and secured a sale over the list price. We are extremely pleased with your efforts and with the foresight you exhibited in persuading us to purchase the property 7 years ago. The return has been exceptional. On behalf of Merle Swyrd, Edna Sutherland, and myself please accept our most sincere thanks for your expert guidance in selling their property at 207 W 13Th. Ave. It was a pleasure to deal with you and your associates. Every aspect of the process was carefully thought out and planned. You are a true craftsman. All three of us have spent a total of well over 50 years in Real Estate in Alberta and I can assure you that we have never dealt with anyone who was more professional and proficient than you. There is no doubt that we not only got ourselves a good Realtor but also a good friend. It is with the highest regard that we will tell everyone that is either coming to or leaving Vancouver that you are our Realtor of choice and you should be theirs.